You've never seen a Rose of Sharon like this before! 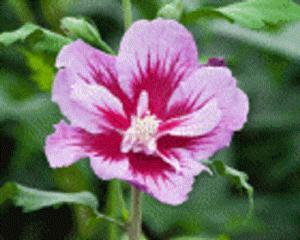 Purple Pillar® is a totally unique rose of Sharon in that it naturally grows as a narrow column instead of a wide, spreading plant. In summer, each stem is packed along the length with purple blooms. Anywhere you need a little privacy and/or color in a narrow space, this plant is a great choice. Blooms on new wood.